Thousands of people who have joint replacements could, in future, have their recovery monitored by a tablet hand-held computer. The Golden Jubilee Hospital, in Clydebank, is the first hospital in Europe to try out technology which allows doctors to keep a much closer eye on the recovery of their patients. Motion sensors, like those used in mobile phones, monitor and record the range of knee movement even after the patient has gone home. 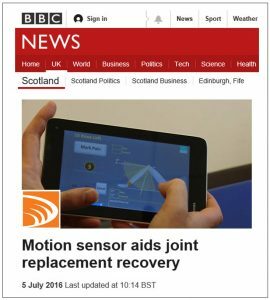 BBC Scotland’s health correspondent Eleanor Bradford has been to see it in action.